If you're looking for an easy 'scratchpad' for getting your ideas down, then Spire is an upgrade on Voice Recorder. Trim feature would be welcome. Multitrack recorders are nothing new on iOS devices, but there aren't too many free ones that offer great sound quality. Spire from iZotope is one such app. Drawing on technology developed by iZotope over the years, Spire automatically adds audio processing to your recording. 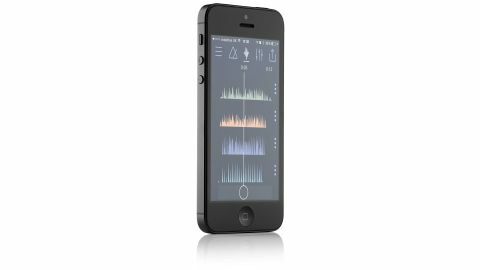 The app features a built-in limiter, de-esser, dynamic EQ and compressor, which are all applied to each track instantly. There's also a metronome, with tap-tempo function and voice control which is only able to start recordings. Once your audio is captured, you can mix the tracks using an XY pad for volume and panning, which is simple but highly effective. As soon as you're happy with the results, you can share your mix via AirDrop, text, email and even to the MadeWithSpire SoundCloud should you wish. One thing we would like to see in an update would be a trim function. You have to be quite precise with your recording start and end points if you're looking to create a loop.